flange plate complete with all connections required for the functioning of large size plastic tanks, made in: nylon rinforced flange - threaded cap with vent - fuel pick-up with ø 10 hose terminal - vent 3/8" ø 16 - blinde flange ready to take fuel gauge. 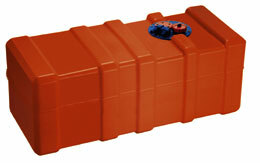 Required tank opening: 120 mm in diameter. See "Datasheet/Info" below.